Get started with the SMH-200 and wrap every load with professional results. The high-performance turntable locks products in place to protect against slipping or shifting. This ensures structurally-sound, durable pallet loads – every time. Whether you’re looking to increase your throughput, reduce your labor costs or improve the integrity of your pallet loads, the SMH-200 gets the job done. All components are covered by Wulftec’s five-year unlimited-cycle warranty, guaranteeing long-term productivity and reliability. 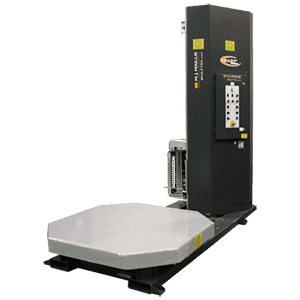 To learn more about the Wulftec SMH-200 Semi-Automatic Turntable Stretch Wrapper, give us a call at (609) 337-3641 or request a quote online. No matter when downtime strikes, contact Hughes Enterprises to get your packaging line back up and running. We send our factory certified technicians across the nation to deliver the maintenance, repair and emergency services you need – when and where you need them.